The life of sitting at a computer for 12 hours a day is catching up with me, it seems. My spine must be holding a grudge because I've been in and out of doctors' offices for the last 2-3 weeks. It's *slowly* getting better, so don't worry about me just yet. I'm only 31, so I have at least another good 10 years in me. As for the move, we're going back to Nebraska. My wife's work has been hell, so our second attempt at living in Colorado has failed. We're not excited to leave the state because we love it so much, but a lot of other things are working out great. We'll just have to accept that Nebraska is our forever home. Such is life. What does this mean for Lysa? Not much really. It has slowed me down quite a bit, but I'm still chipping away. Maybe I'll have to bump the next prerelease back a bit, but not too far. Plus, there might be a huge boost in activity on the project soon! I'll keep you updated. 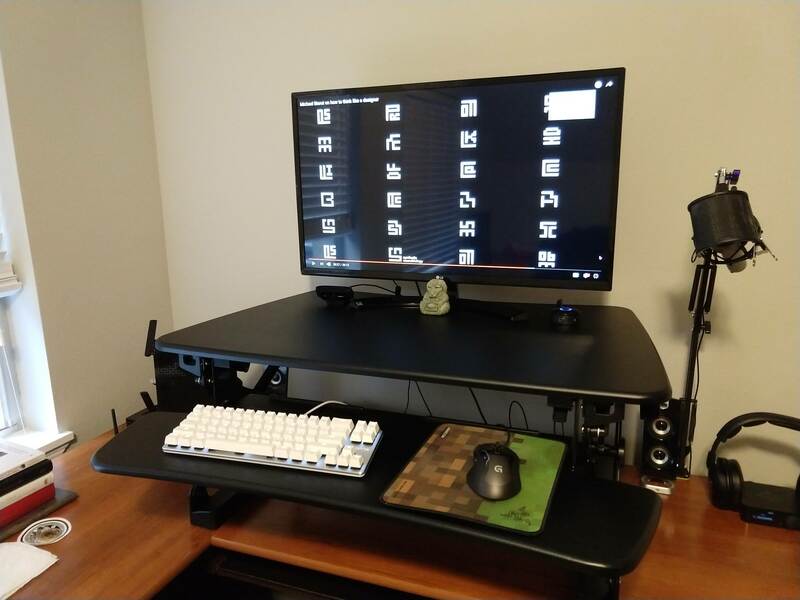 [Edit] I forgot to show off my new "standing desk" with the hopes that it helps my back in the long run. This monster raises and lowers with minimal effort and is pretty sturdy. Good luck with the move, and I hope you find a permanent solution you guys are happy with; as well as a full recovery of your back, which is never a fun or funny thing to have problems with. Stay safe, and remember: Hugs not Drugs. My recommendation would be a Salli saddle chair and an electric sit stand desk with a bodypocket cut out. They say standing up all the time is just as bad as sitting all the time. The mantra is your next position is your best position. Which means if you are uncomfortable, move. I didn't do a thorough search of all my options, but the img above shows my sit/stand desktop. It goes up and down with a lever and a bit of pressure. I was surprised at how easy it was to adjust. Thanks for the recommendations. I'll check them out for future upgrades. I mentioned the saddle chair because it gives your spine a nice S-shape. So even when you are sitting down it is the same as if you are standing. Also you do not get the sleepy feeling you get in normal chairs, because they cause your blood to pool in your lower extremities. The body pocket on the desk is so your upper body gets support if you sit for long periods, because saddle chairs don't have a back support. I got the chair a year ago but can't make a decision on the table as I'm very, very, picky. lol Anyhoo enjoy your table. I suggest swimming, it helped for my back. Take care of yourself man ♥. I hadn't thought of swimming. We'll be moving to an area with a gym and pool in our neighborhood, so I'll have no excuse to sit at home being lazy. Hope the swimming helps. Take care!